This is my "Toddler Time" quilt. It's an idea I've been playing around with for a long time. It's sort of my modern and minimalist version of a child's I Spy quilt. I've been a teacher and principal for many years and dealt with a lot of overstimulated, hyper children. It seems today that children are introduced to technology earlier and earlier and television, videos, and video games have become the substitute for interaction with friends and parents. Children learn best not from fancy computery things, but one on one with us. This quilt is my way of providing an opportunity for some of that one on one, parent child quiet time. I would use this quilt to spark conversation, for telling stories and for learning together. There are 12 pictures hidden under the letter flaps. The purpose of the letters isn't really to learn the alphabet; they are simply a way to open the conversation. There is something in the picture that starts with the letter on the flap....maybe multiple things. It may not be so obvious in the beginning. ...painter, painting, paint brush or even pink! Think of all the things you and your child could talk about from this one simple picture. Places to visit, things to do tomorrow, what happened in art class in preschool...the possibilities are endless. We could talk about artists, easels, palettes, canvases, museums...I could go on! ...wheelbarrow! What do you think this little man is doing? Where is he going? What is he carrying in his little wheelbarrow? Do you think you and your little one could make up a story together about his adventures? The back has a few more pictures, but not too many to be overwhelming. I'm still working on the design and concept. I'd appreciate some help if you have some feedback for me. Does the quilt need more color, or are the flaps enough? I do like the solid background to keep the quilt visually simple, but the white might not be practical. I'm also wondering how big would be the best size for the quilt. Would you make it in a twin size? I'm also wondering if I should have quilted over the pictures? It obscures them a bit. Lastly, do you think it even needs the letters? 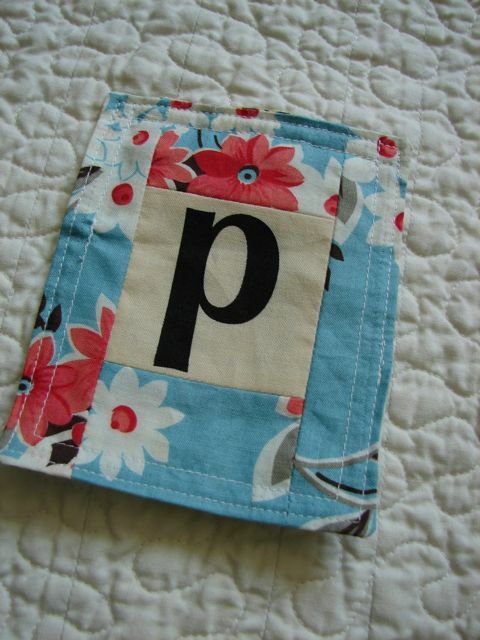 I have this great fabric with these letters which made the flaps easy, but that's not available for everyone. There are lots of options for the letters, printing, piecing, embroidery...but are they necessary? I'm trying to work this into a pattern, but I'm not sure which way to go. Any help would be so appreciated. I have to thank Kerri of Sew Deerly Loved. Kerri helped me with prints for the pictures and she's your online source for lots of great fabric that would work in a quilt like this. This was one of the ideas we threw around for the book, but it really didn't fit. I'm glad I'm finally back to playing with the idea. On to version #2! In the meantime, I have a new grand niece or nephew on the way and this quilt already has a home. I love this jacquie. I am a teacher too and don't even get me started on "educational toys." UGH!!! anyhow. I really do love this. my first thought was to use the letters to start words that make up a story. I do love the flaps. I love that it's tactile for really young kids, and then as they get older they can be more creative. I think this is a sweet idea. I would like to see all 26 letters of the alphabet and in order. I would think lap size/playmat size would be practical so maybe smaller and closer together flaps/squares. If you were going to make it with less squares then how about just the letters in the child's name? I love the concept. White would never survive in my house. A lap/cot size is great for kids. It is a mobile size and has room enough to sit on or snuggle. The flaps are great as are the letters. Some arrows or geese pointing to the letters or the items underneath is another option to break up the background a little. 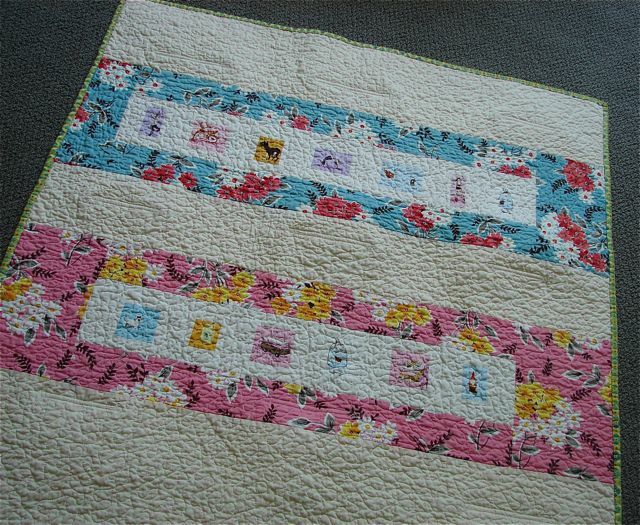 This is really lovely - both the concept and the finished quilt. Personally, I love the letters and since there are so many different ways to create them (as you noted) I don't think it would be a big deal if someone couldn't find a lettered fabric to use. I like the idea of using the whole alphabet but maybe just 13 letters per quilt side (because I really enjoy all the negative space as well). And I wouldn't care if the letters were in order, in fact, I might prefer them random. As for quilting over the sweet little pictures, my preference would be to maybe give them a simple frame of straight stitching so as not to obscure any of the details. Having made two I Spy quilts for my kids, I have to say that they both truly love playing with them. One was made with two blocks from each fabric so that they can "spy" the item and then find it's match. And the other quilt has letters hidden throughout that spell my daughter's name. They are truly treasures in our family, just as I'm sure yours will be! Oh! And as for size, one of ours is twin size and one is more lap size and the lap one is much easier for the kids to tote around and move on their own. They have a tough time with the twin size one because it's heavier and bulkier. Love the idea of sharing and telling stories! I think using a solid color background would be a nice variety, maybe a brown? Look forward to the release of your book, Jaquie! l have never posted a comment before but have 3 children and think that maybe a themed quilt, possibly trains(my son was a thomas the tank engine fan), animals and gardens etc. l know that my little girl and l like to talk about the colours, sizes and textures of flowers on the way to nursery by checking out the gardens. Amazing! Yes, this would be the perfect quilt for one to one contact with a child. How fun! So cute! I really love the idea and the simplicity of it. I think if I were making one then I'd want the whole alphabet in there so that it would interest an older pre-school child too. My daughter loved books with lots of objects on a page that started with one letter when she was about four. But I'd think that within the context of making this into a pattern, the number of flaps would be up to the sewer, as would the theme they chose to use. I don't think I'd quilt over the picture underneath, leaving it unquilted would really emphasise it when the flap is lifted. I'd also agree with Megs that for that age and as a fun object, smaller would probably be more useful. I love it! I think it would look great on our bed :) A quilt for the whole family! Would be a great way to start a story lying down for nap-time. I think the letters are fun and make me curious to look under the flaps! Very cool idea! 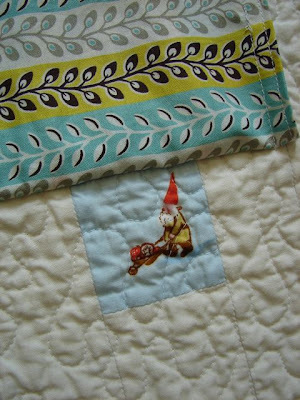 Of course I love the FMF & HR fabrics too...someone will cherish this quilt for sure! Caveat: we don't let my son watch TV aside from the videos that I take of him & that is minimal & I do not care for noisy/battery operated toys, so this would be aimed at us (if it were offered in a shop). My son is 2.5 & prefers his big I SPY to the small "car size" one. (I made one that can fit over his lap in the car.) I got carried away & made his JACOB quilt twice as big as it needs to be. It has 60 images for each letter in his name. Right now he loves looking at & for the airplanes (the quilt has 6 or 7 different airplane images)The smaller quilt only has one airplae & that is not nearly as satifying for him. He can't look for the blue one after finding the red one. He has no problem pulling along/carrying it/pulling it up onto the bed/scrunching it... (Size doesn't matter.) I think the white is o.k., but I know that a lot of people would be afraid to get it dirty. I think the letters could/should be optional. That way the painter could also be an artist using an easle & would eliminate the desire to see the rest of the letters represented. (I looked back at the shot with the letters & tried to decide if there was a subliminal message for the child later in life - W is for grandpa Walter, etc.) When I decided that the letters were random, it seemed confusing to me. I like the whole thing quilted equally - it will be washed a lot. My next I SPY will have 400+ images, so I can't speak to the minimalist aspect. :o) I want to use all of the pretty pictures - without having to have a 100 quilts. My husband seems to think that we have reached critcal mass. My grandson loves his I Spy quilt. He plays all kinds of games with it. It has been a tent, a cape, a bed, so many things. When I made it a fellow blogger from Australia says they make small 18" by 18" quilts for the kids to take with them in the car. 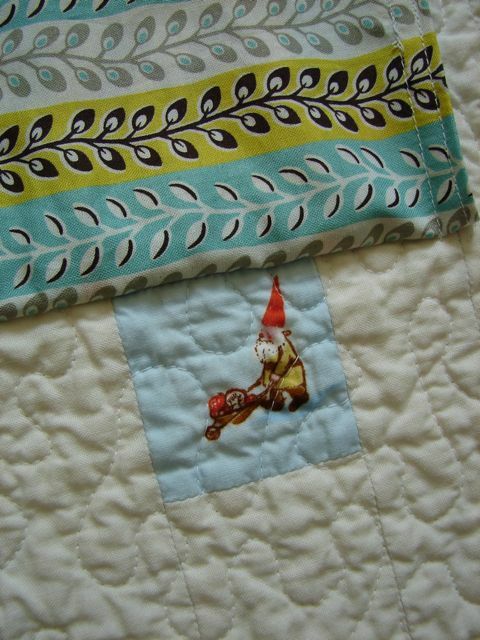 They fussy cut novelty prints and make small quilts and use it to tell stories. Isn't that a neat idea? I think other letters in the negative "white space" would be good too. the letters should stay--they lend themselves to learning as well as the conversation aspect. This is a darling idea! I love it and can't wait to see where you go with your design. I would like to see the entire alphabet. I love the color coming from the flaps and how you have let them be the focal point. I also agree that not quilting over the pictures might be a good idea. However, I really like the quilting over the pictures. Just wondered if it might be better for a little person. It truly is a charming quilt. This is such a great idea. I like the letters on the flaps. I can imagine a child getting a great sense of accomplishment from matching the flap letter to the part of the picture that starts with that letter. As for size, remembering when you asked about pattern pet peeves, people like options - I'd aim for a pattern with at least nap and twin sizes. Oh, this is SO darling!! Anything to help a child and parent interact is fabulous. What a great thing to snuggle on and talk about!! I like the solid background, but would not choose white..too hard to keep clean. LOL... I don't think sewing over the pictures makes it too hard to see/look at. I think the flaps are enough color, maybe just add more? Especially if it's a twin size. And yes, keep the letters!! What a great way to learn them! Excellent! I just love it. Hi Jacquie! I think you are on to something special here. I like the flaps and the hidden pictures. White is aesthetically pleasing but probably would not work in my house with two boys. I personally like square quilts for this kind of conversation quilt (65" square is my favorite size) because it's roomy enough for two people to on it and not worry about falling off. 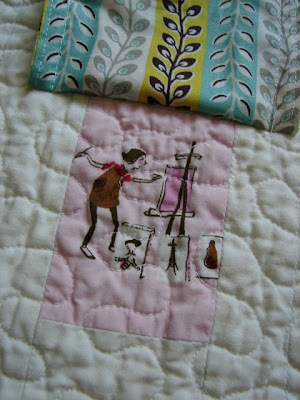 Loving this quilt Jacquie! it's wonderful. Another teacher checking in! I love this. I have been wondering how to incorporate quilting into my classroom. I teach third grade and wonder about having them help make something like this for a younger classroom. That could be a fun project where both grade levels learn something! ok, blogger just ate my big long comment. IN summary - I would not quilt over the pictures, use stone/ash for the background if you don't like to spot-bleach, go for lap size. And my 5yr old loved to see TWO of his letters in there, so it would be fun to use letters for the names in your family. I don't think you need the whole alphabet. Love that they connect to the picture underneath. I love this idea! In your next version, I think I would like to see more randomness in the layout of the flaps. What a fabulous idea! I think that quilts for babies/children are such a nice, simple present, but this would be such a more meaningful present. I like the suggestions for ways to use the quilt as well -- it makes it a great teaching tool for parents as well as for kids. My mother was an early-childhood reading educator, and she always read books to us this way, asking questions and having us point to things on the page. I am not a quilter. My mom and mother-in-law are quilters, and I'm the mother of a three-year-old, with another on the way. I love the idea of this quilt. I don't normally like minimalist looks, but for the purpose of this quilt, I wouldn't go any other direction with it. The white is okay, but a pale green or yellow would work well, too. As for letters, I think you need the flaps, because they add to the fun and interaction. The flaps don't necessarily need letters, though they're not entirely superfluous. You could even find a way to work numbers in, too. That might end up being too much. I agree with your observation of not quilting over the pictures themselves. I think they'll stand out better and be clearer without the quilting. I might actually make this a throw size or crib size. For its purpose, it doesn't really need to be any bigger. And the overall look and feel read "nursery" to me -- not toddler or preschooler. I'd suggest putting the letter next to the picture rather than the flaps. But that's just me, I think the flaps are still wonderful and kids would like them but as they age I don't know how they'd hold up. I think a bed runner (thin and long) would be nice size, something children can lay in front of and still see a bunch of the pictures. My son always love it when grandma lays down on her tummy next to him to read a book, in someways he loves it more than sitting on her lap. You make such amazing quilts! This is such a great idea! I agree that too many children are thrown in front of the tv and expected to entertain and teach themselves. What a great way to encourage interaction. Another wonderful example of 'less is more.' It is fabulous! This is so fresh and pretty! GREAT JOB! Love this, Jacquie. I have 4 kids and can tell you this would be a big hit in our house. We have several I Spy quilts and they just love them when they are young. The white would be hard with dirty little feet, hands, etc. but love the negative space and simplicity of design. Perhaps a light gray would give the same effect with more practicality? I really love the tactile nature of the flaps, and think the letters are cool, but not mandatory. Maybe showing a with and without letters option on your pattern would get the ideas flowing for sewists. I love the concept of looking at/talking about the images and seeing where that leads. From my experience with my kids, the smaller toddler or lap size is better than a bed quilt. Oh you finished it! Looks fabulous and fun. I'm thinking, for a very small child you might prefer to use bright colours for the flaps, I know that when my littles were infants/toddlers they responded more to reds, bright blues, school bus yellows. i don't mind the letters being out of order, especially considering that speech and language development do not follow the order of the alphabet. excellent idea, jacquie. i especially love it as a conversation starter with children; did you know that children brought up in a rich oral setting learn almost five times as many words by the age of four as those who aren't? Fabulous idea, Jacquie! I'd suggest a color instead of just white. The flaps are fun and I don't think you need all the letters. When kids are just learning, 26 must seem overwhelming. Lap or crib size seems the most practical. Run with it! The thing I would comment on is the size. If you are playing with it then it is best that the flaps be easily accessible. Too big and you have to lay on others or have them folded aside. So smaller is better, or larger, with an accessible lay out (like around the side)? Hi Jacquie, thank you so much for stopping by at my blog and saying hi! I am great admirer of YOURS and get a lot of inspiration out of it. It's great. Your last kid quilt is really special and cute. what a wonderful quilt and great execution of the I-spy quilt! As a mom of 2 young girls, I'd have to say less is more. Especially for developing simple stories or just talking about each image. There is so much to talk about - the scene, the objects, the colour, and imagining the what they are doing. Talk about improv story telling. If the quilt is for an older child - a "Where in the world is Waldo-esque" I-spy quilt might be more engaging. I personally love white backgrounds but for young kids/babies, something that camouflages stains would be more practical. IMO the quilt size would depend on the age of the child. A smaller one for a young child so it may become his or her's "lovey". I love the flaps and letters and the embroidery adds a lovely touch. Thank you so much for sharing your projects, I can always find great inspiration on your blog! You've really got a terrific idea and of course a darling quilt here. I like the preprinted fabric for the letters, but your right there are other ways even like the inkjet fabric and print out your own letters. I think a little smaller than twin size though so smaller hands can manage it. May even reversible? that way you can get all the letters on there. I like the white backing. So what if it gets a little used looking, that's whats supposed to happen and the more it's washed the softer and crinklier it will get. Okay I didn't read any other comments, because you asked for opinions and this is mine. Love the quilt. The color of the flaps is enough. I think depending on the square size I wouldn't quilt over the pictures. I think if you made it twin size, I would not put flaps on the drop portions. I would put the label under a flap on the back. I would also possibly try to put a black and white striped binding if I used black and white letters. I would use the letters because it adds more interest and as a grandma to a 4 year old, I believe that letter shapes are intriguing to her and would draw her in. She loves trying to draw letters and points them out often. That is all I have to say at this point, but aren't you sorry you asked for comments? Great idea. The white background looks good, but is propbably impractical. If keeping the letters and you know who it's for, you could use the letters of their name (with extras if it's a very short name!) Maybe include an option to make the flaps and squares larger? I love the uncluttered negative space with all the action under the flaps. Good luck - I think it will be a great hit. - I love the back of the quilt. I would suggest you take that idea and make it the front. Rows of fussy cut images inside the large row block. A great way to use print fabrics alongside the I Spy Novelty prints. I haven't seen this done before. It's difficult to come up with an I Spy layout that hasn't been done before and you did it! 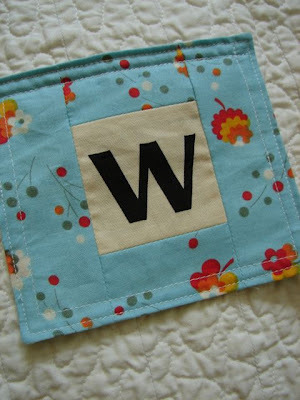 - Use the entire alphabet on the back of the quilt in pieced blocks. It could be a combination of fabrics with letters printed on them and paper pieced letters if you don't have a print to make it work. 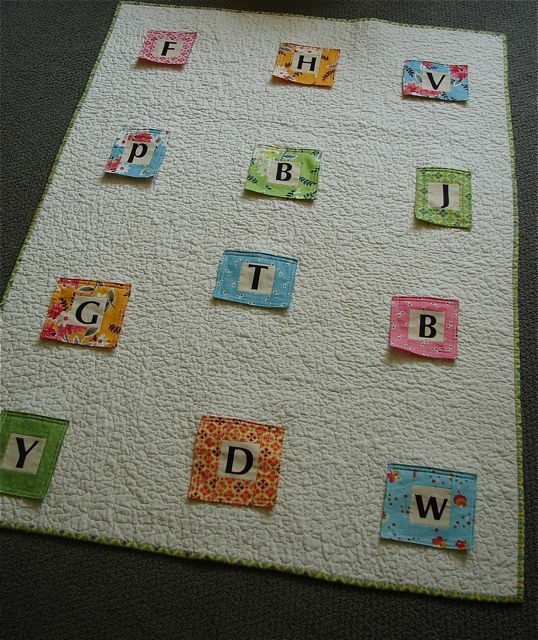 Quilters could lay the blocks out in order or random or just their kid's name. The game could be image/story play (the front), letter play (the back) or a combination of both. - I'm not big on the flaps just because I'm not sure how practical it is as a quilt that can be played with as well as take a nap with. You always have to be able to take a good nap with a quilt. Let me know when you have the pattern finished so I can sell it in the shop! I love the quilt! Personally, I like the letters and the flaps. From my experience, kids love hidden surprises. The only thing I might do is have a piece of velcro or a snap to anchor the flaps. I like the solid background. Personally, I like the white but a nice light gray might be more practical for kids. Such a great idea! I'm definitely going to do this for my son. This can be quite flexible. I think letters and numbers are great, but as I don't have them (or want to print them), I think I would go with scrappy houses (plus I love some extra piecing). Then various novelty prints of people, toys and animals behind them. I like the flaps, but I agree with someone else, a little velcro would be needed. I can see them becoming messed up when washed if not anchored. I wouldn't quilt over the novelty prints, but perhaps do some strategic anchoring with knots or hand stitching (big easy colorful ones). You can set this up as a Go Fish game, but then you'd need a lot more blocks otherwise it's too easy. I like your "less is more" approach for the story-play mat. I think you can go as large as 5 feet, but it might not be as easy to place on the floor and lug around. 3x4 feet might be ideal as they can play on the bed or the floor too. I think any color background is OK if it reads as a neutral (grey, beige, sage green, light blue). Thanks for the inspiration! Can't wait to see version 2! I like the letters. My grandson has always loved the alphabet on things. I agree with you about the quilting over the pictures. I does obscure them, so leave that out. A small dot or stripe for the background would add interest, but not too much chaos. The size should be playmat or lap. Incorporate all the alphabet. Great idea. Great quilt, front and back! Personally, I like the flaps and letters. My 3 year old's favorite books are lift-the-flap type, so I know she'd love this. I'd like to see the whole alphabet too. I can see it as a great kit. I think this quilt is great. It would be such fun to play with as the child lifts the flaps (my children loved flap books, but they all eventually got torn up!). I don't think it needs anything else on the front, or the back. However, I wouldn't want the background in white. I still try to avoid anything white for my children who are now 7, 7 and 11. This is a great quilt. I have taught early years for a long time, kids love flaps, letters, texture, colours..... I like the white background. I like Angelas idea of themed quilts, I also thought personalised quilts would be nice, using the letters from the childs name. I thought that lower case letters would be good for those just learning their letters. Really like it! I LOVE this quilt!! Fantastic job! I like how it works with children raising the flap (because of curiosity for one thing) and the learning part. The back is fun! Great job!!!! Wish I knew about this when my kids were small. I made the plain old I Spy quilts. Yours is so much better!!! Let me know if and when there is a pattern to buy!! Oh, so wonderful in all its simplicity! I don't think it needs the letters on the flaps at all, though it's fine and lovely on your finished quilt. Not quilting the pictures was a good call, I think, and I'd totally make a twin size, it's fantastic! Love the plain background, too. In fact, this may be my favorite of everything you've done! As a mother to a little boy with an autism spectrum disorder, this quilt is fantastic! I know every kid has his thing, but my son has a real affinity to letters and numbers. I think using the entire alphabet would be great, although placing the letters randomly would by my preference. A lot of autistic children learn by memorization so having the letters scattered in a different pattern from the normal ABC song would help the parent know that the child really has learned and can recognize each letter. I think the novelty prints are great as you mentioned as they can be great conversation points. One thing we've been working on with my son is two-way conversation (since most of the time he answers a question, but doesn't ask one of his own). The images you've included provide great questions and appear to have a bit of a story already. Anyway, I think this is such a great idea. Nice work, Jacquie! What a phenomenal idea! I love it! Wow! i reallly love this idea and this quilt. You blow me away with your ideas. I am always fed richly when I pop over to your place. I love it, it's perfect! when I was little my babyesitter made me a "quiet book" a cloth book with little things similar to this on each page some were sewn like the choo choo with button wheels, some were painted like the clock with hands that you can move, some were both like the teepee with a zipper that had a painted indian inside....I still have that book. I LOVE this! I teach preschool and I agree 100%, children are overstimulated. Parents forget, technology isn't the great teacher....it is them. I love the idea of getting parents to talk with their child about this quilt. Amazing! I've been dreaming up something similar and it's so fun to find your quilt! Your work is great and I'm completely in love with this quilt! Have you seen Ashley's "munki in the middle" quilt? Lovely framing of Heather Ross' munki munki images with bold colored frames. Would be great for the alphabet / I spy concept you have going here!